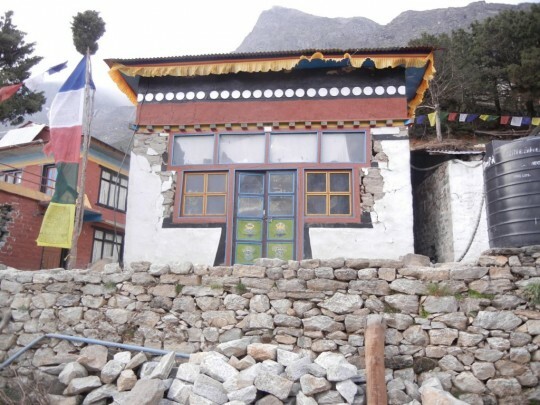 Extensive damage to the Lawudo Gompa was sustained due to the 7.9 magnitude earthquake and subsequent aftershocks of April. For students of Lama Zopa Rinpoche, Lawudo, which is situated high in the Himalayan mountains of eastern Nepal, holds particular significance. Lama Zopa Rinpoche is the reincarnation of the Lawudo Lama, Lama Kunzang Yeshe, who lived and practiced in Lawudo until his passing at age 81. The Lawudo Retreat Centre was built over several years and completed in 1972 under direction from Lama Zopa Rinpoche. The gompa was built so that young monks in the area could receive a good education with favorable conditions. Since that time, Rinpoche’s mother (who passed away in 1991), sister Anila Ngawang Samten, and brother Sangay Sherpa have cared for the Lawudo Lawudo Retreat Centre and welcomed pilgrims, retreatants and locals to this extremely blessed and remote place. The Lawudo Library is in desperate need of repair. 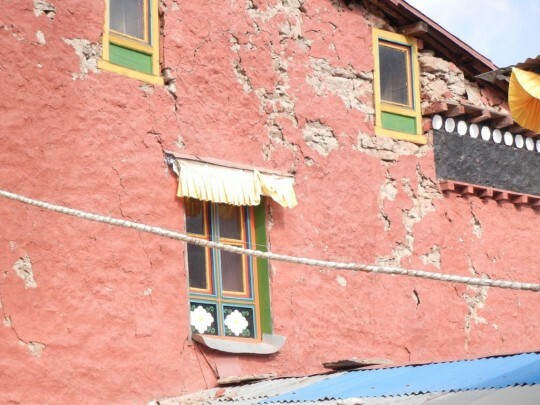 The property, which includes the gompa as well as a retreat houses, a library and prayer wheel, suffered extensive damage from the 7.9 magnitude earthquake and subsequent aftershocks in April of this year. Fortunately, those living at Lawudo are all okay. They have been living in tents outside. However, it is getting very cold and proper accommodation will be required as soon as possible. Renovations need to be completed as soon as possible so that those living in Lawudo have protection from the monsoon season’s extreme weather. 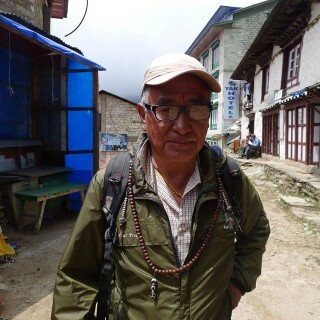 Lama Zopa Rinpoche’s brother, Sangay Sherpa in Solu Khumbu, Nepal. Photo by Ven. Katy Cole. I have inspected all the damages in Lawudo and am ready to start renovation work. Due to damages from the earthquake it is very difficult to find workers but I luckily found a builder and carpenter so I have booked them. I am rushing to do the renovation work because in monsoon season, due to heavy rain, the damaged parts will be made worse and may collapsed more. Then, after monsoon season, the Winter starts and as you know in Winter no work can be done in Lawudo. So I should finish the renovation work as soon as possible. 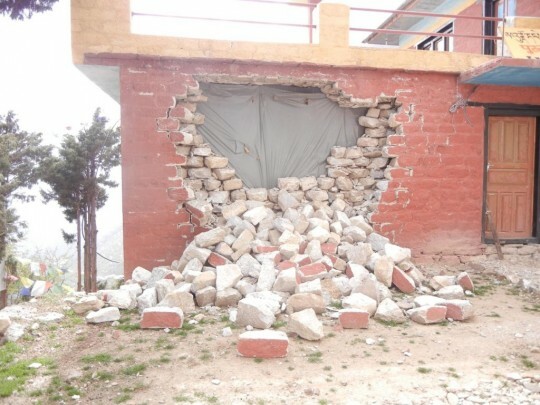 I have targeted to finish the renovation of retreat houses. I am planning to renovate all damages very finely so it cannot be damaged by upcoming normal disasters. So we don’t have any problems in future. Due to the remoteness of Lawudo we can’t organize renovation work again and again. We should be confident about the strength of this renovation work. The Nepal Earthquake Support Fund offered US$50,000 toward this much-needed renovation work in Lawudo. So many generous donors have contributed to the Nepal Earthquake Support Fund making this offering possible. Additionally, Australian nun Ven. Katy Cole recently traveled to Lawudo to help facilitate this work and thanks to the kindness of Effie Fletcher and Amber Bamjan Tamang, a kitchen tent, tarp and rope were brought to Lawudo by helicopter. Please rejoice in the kindness offered by many to help rebuild from damages sustained. All are welcome to donate to the Nepal Earthquake Support Fund. You can learn more about Lawudo Gompa and the history of Lawudo. You are responsible for your own problems just as you’re responsible for your own liberation and enlightenment.